In the closing days of January 2018 it was revealed that Dermot Mullan, headteacher at Our Lady and St Patrick’s College in Belfast, was accused on plagiarising the work of another teacher. Mr Mullan immediately confessed to the offence and that, it would seem, is to be the end of the matter. His Board of Governors made no comment, the Catholic Church made no comment, and – most concerning of all – Northern Ireland’s General Teaching Council remained silent. This silence is puzzling given that Mr Mullan heads a school which makes much of its lofty Catholic principles. How does a plagiarist urge honesty and integrity on pupils in general (and pupils taking GCSE and GCE examinations, in particular)? How does Mr Mullan discipline a pupil suspected of copying the coursework of another pupil? Surely the parents of the culprit will detect a double standard here: there seems to be one rule for the children and another for their principal? Dr Neill Morton pictured with Professor Tony Gallagher at QUB graduation. The existence of a disturbing double standard is nowhere better illustrated than in the intervention of Neill Morton, the self-styled “emeritus” headmaster of Portora Royal School. Despite being the Education Chair of Northern Ireland’s Examination Council (CCEA), Dr Morton appeared on BBCNI television Newsline on Monday 29th January 2018 to assure the public that the whole issue of Mr Mullan’s plagiarism was overblown. This clearly demonstrates one law for pupils taking examinations and another for their teachers: if Dr Morton’s view of Mr Mullan’s indiscretion were applied to pupils, then the entire concept of public examinations would collapse. In short, Dr Morton’s comments on Mr Mullan’s plagiarism should immediately disqualify him from any public office concerned with public examinations. Dr Morton’s failure to condemn Mr Mullan’s activities outright is even more surprising given that he has recently completed a Doctorate in Education at The Queen’s University of Belfast. A glance at that university’s website or a random walk through its McClay library will quickly reveal the seriousness with which it views plagiarism. When pupils are charged with plagiarism the consequences can be drastic: their grades can be deleted; they may be expelled and the pupil whose work was plagiarised may fall under suspicion. One doesn’t seem to encounter the same clarity of decision-making when it comes to settling the fate of a highly-salaried headteacher like Mr Mullan. One encounters the same imbalance in respect of university students and their teachers: one can spend many hours searching for a well-defined Queens policy on staff accused of appropriating the work of other academics. The claims advanced here deserve a response. It is completely unacceptable that Dr Morton’s judgement of Mr Mullan’s plagiarism is entirely at odds with the treatment of examination candidates guilty of the same offence. How must the parents of children judged to have plagiarised in an assessment have reacted to CCEA’s Education Chair making little of a headteacher facing the same charge? Why have the Governors of Mr Mullan’s school not made a statement? Why is the Catholic Church silent on what is a failure in morality in a person charged with leading by example? Finally, why are teachers, pupils and parents yet to hear a word from Northern Ireland’s General Teaching Council? This advertisement appeared in the Antrim Guardian last week three days before the closing date for parents/guardians applying for this year’s 11-plus entry tests. 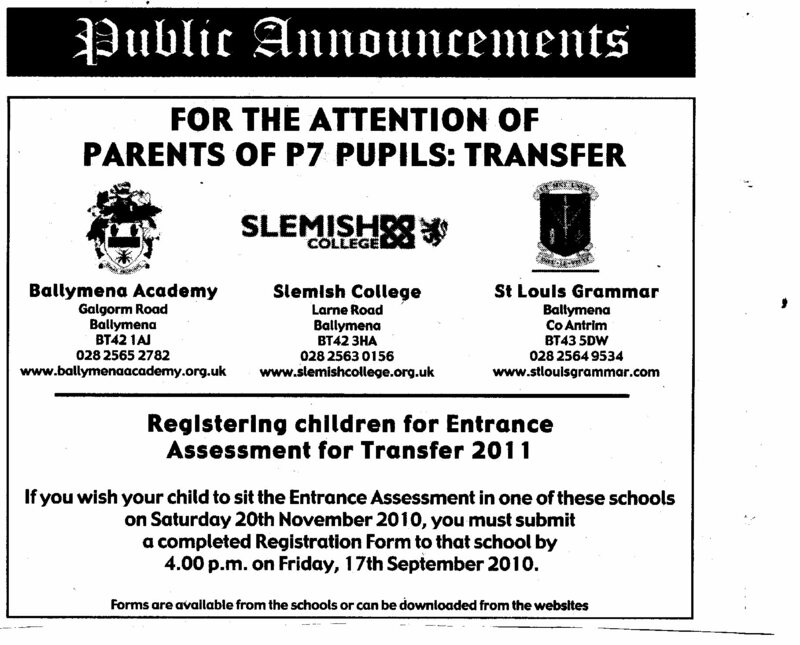 Of immediate note is that the three schools mentioned, Ballymena Academy, Slemish College and St Louis Grammar School are all members of the Post Primary Transfer Consortium (PPTC). There is no mention of this important fact in the advertisement. The PPTC commissioned GL Assessment to provide the multiple choice tests for which they paid approx £350,000. The group then claimed that the tests were “free”. Finbar McCallion of the GBA spend time over the summer trying to convince the public that a common test would result. The advert in the Antrim Guardian makes no mention of the PPTC, GL Assessment or the fact that the tests are multiple choice. The reason underpinning this reticence is that behind the scenes the GBA, the Governing Bodies Association are attempting to persist with the fallacy that a common or single tests will unite the two groups the AQE and the PPTC. Nothing could be further from the truth. The two tests only came about when the PPTC and the Catholic schools majority of the GBA refused to offer the AQE tests to their schools. In effect the 11-plus transfer system was both sectarianised and devalued. It should be remembered that the Catholic hierarchy have committed to end academic selection in their schools by 2012. Any multiple choice exam based on the revised curriculum serves the PPTC purposes but in effect misleads AQE parents and according to one well placed source “devalues education”. In case MrMcCallion has missed the news due to illness in the family post The St Andrews Agreement – academic selection by valid and reliable testing remains legal for admission to grammar schools. In 2002 the chairman of the GBA, representing grammar schools in Northern Ireland returned to his job following a so-called row over comments made by senior Catholic bishops. Finbarr McCallion took the decision to withdraw his resignation from the Governing Bodies’ Association over the weekend after he received a unpublished letter from the bishops. (this letter remains secret). And Bishop Donal McKeown said that grammar schools could not continue in their current form, given an expected demographic downturn and low numbers. Recently Mr McCallion has been aided in his efforts on a common test by Ronnie Hazzard of Ballymena Academy and Dermot Mullan of Our Lady & St Patrick’s College, Knock. Good luck with that gents – parents are on to you.